The tangled web of this article is fascinating. Cincinnati.com is owned by the Cincinnati Enquirer, which in turn is owned by Gannett who also is the parent company to USA Today. This article is clearly from USA Today, but it appears as though they allowed the Enquirer to change the title to be relevant to their market even though Drop Tower clearly isn't the focus of the article. According to the article, KD's Drop Tower "rises up a 305 tower and drops 272 feet". KI's tower is 315 feet but the fall is only 264. If these figures are accurate, anyone here know the reason for that? Just different manufacturer or style of Drop Tower? The numbers maybe inaccurate but Kings Dominion website states it drops you 27 stories while Kings Island website states it drops you 26 stories (which converted to about 281 ft). My guess is that Kings Island has a longer break section due to the fact it’s the older model, maybe the breaks were improved for the KD model. I believe the tower height includes the spire. I've always been curious: KI had slated a Drop Tower for the Flight Commander area a few years before Drop Zone debuted in Action Zone. Any idea what model was planned for the FC spot? Also, anyone know why KI got one particular model and KD got the other? I’m going to assume that during the 4 years in between the two installations Intamin improved the ride slightly(Which is why KD’s has a longer drop section). They’re both technically the same ride. Ah, I didn't realize the installations were that far apart. 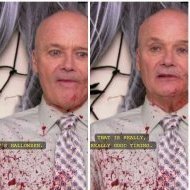 I thought they were back to back, season to season. Actually, I think they're both the same model/type with a few physical differences (KD's has more seats and a different gondola). Both rotate (or are supposed to) during the ascent. Also, I think Intamin calls them "Gyro Drops," the "Roto Drop" is a Roller Coaster Tycoon term. I didn’t realize the KD version rotated. I thought that version was called Gaint Drop. The KD version is superior in my opinion. It doesn't rotate, the gondola is bigger providing higher capacity, and most importantly the restraints are much less restrictive. The KI version I just can't ride comfortably. Restraints are far too restrictive. I believe 264’ is the distance from where the gondola stops at the top to the ground. My understanding was that it was going to be the older generation Intamin, so more like the S&S ones today. Question then. Why do I recall seeing somewhere (cant recall where or when) KI's announced as the Worlds Tallest Gyro Drop? That would make the tower substantially taller than 315’, which I do not believe it is. There's no way that top piece on Drop Tower is 51 ft above where the ride vehicle stops (if you guys are saying the dropping point is at 264 ft and the tower is 315 ft tall). The drop refers to the free fall section and not the break section. The drop section is around that 315 ft mark but it only falls for 264 ft and then it hits the breaks. I have accepted the challenge of estimating the height of the brakes on Drop Tower! 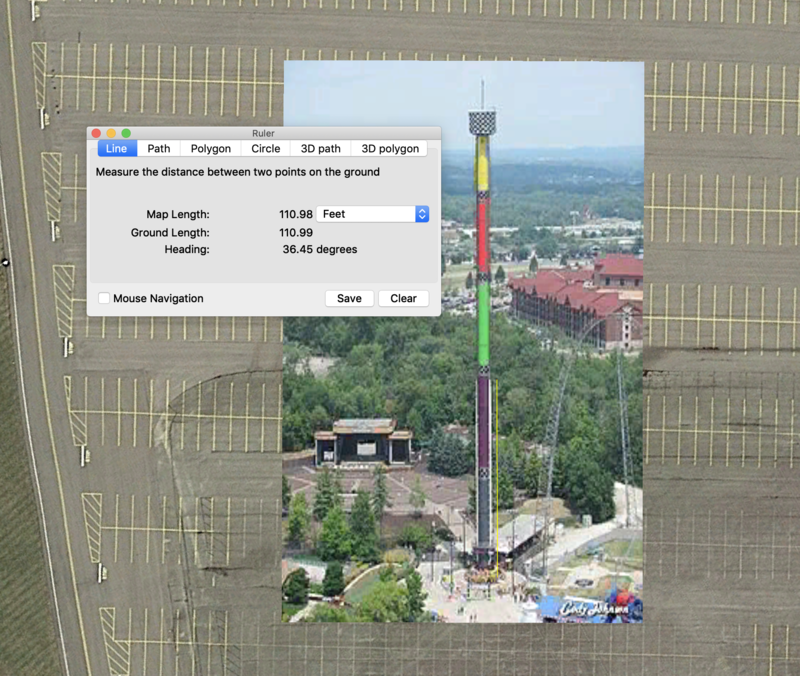 I first measured out a length of 315ft in google earth pro and overlayed an image of Drop Tower to math the 315ft value to ensure the picture was now to scale. Then I measured from the base of the tower to the top of the brake fins on the tower itself. You can see by this photo that the brake fins start at about 110ft from the base of the tower. This would mean that the drop is only 205ft tall if we measure by how much has no brakes. I believe that the 264ft number might come from the distance the rider falls while experiencing 0 g in relation to the seat as this would only stop sometime after the brakes engage. Edit: I have realized an error in my measurement. The method stayed the same but the more accurate height of the brake run is 125ft. So similar, yet so different. Looks like KI got the better version to me. KD’s version has never rotated and was never designed to. In fact, it’s a completely different model. Everything Intamin screwed up with the Gyro Drops, they attempted to fix with Dominions version. Even though they built WindSeeker feet from the FC pad and it looks fine. This was also a different management organization that put WindSeeker in. I believe it had almost everything to do with the decision to move it to AZ and make it part of that lineup for the "new area" in 1999. They may have waited it out for R&D of the new design that would be ready in a few years.